"Darkly romantic and steeped in Southern Gothic charm, you’ll be compelled to get lost in the Heirs of Watson Island series." 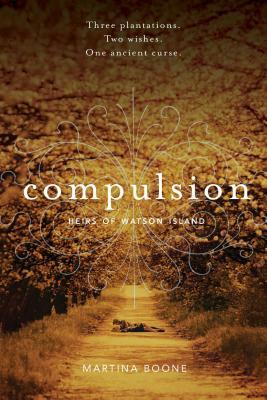 "COMPULSION is a stunningly magical debut with a delicious slow burn to be savored. I want to live in this story world!" "Beautifully written, with vivid characters, a generations-old feud, and romance that leaps off the page, this Southern ghost story left me lingering over every word, and yet wanting to race to the compelling finish. Martina Boone’s COMPULSION is not to be missed." "Martina Boone's COMPULSION is the perfect Southern family saga: charming and steamy on the surface, with cold-blooded secrets buried down deep. Feuding families, sinister curses, hidden things behind locked doors! What more do you want? More time to read it, that's what." "A shivery, delicious Southern Gothic with feuding families, dark spirits, ancient curses... and caught up in the middle, a young girl learning to live and love for the first time. Atmospheric and suspenseful, COMPULSION will draw you in and hold you until the very last page." "Ancient spirits, mystery, and Southern charm—what more could you ask for? COMPULSION mixes dark magic with darker family secrets in a way that'll make you relieved there are two more books. I can't wait to continue reading about Barrie and the rest of Watson island!" "A little bit Gone with the Wind, a little bit Romeo and Juliet...Boone’s debut mixes a Southern gothic setting with fantasy and romance for an engrossing...mystery." "A paranormal Southern gothic with decadent settings, mysterious magic and family histories rife with debauchery." In Boone’s debut, an expansive Southern gothic tale, Barrie Watson is sent to live with her aunt Pru on Watson Island after Barrie’s shut-in mother, Lula, dies and her godfather is diagnosed with terminal cancer. Barrie was born with a “finding gift” that compels her to seek what is lost or left unsettled, and amid the Beaufort and Colesworth clans—the founding families of Watson Island, along with Barrie’s forebears—Barrie learns she isn’t the only one with a gift. Curses plague Watson Island, ghosts haunt its mansions, evil spirits live in its woods, and a frightening “Fire Carrier” emerges at night over its waters. Together, Barrie and a handsome Beaufort boy named Eight seek justice and to right old wrongs. Though the novel is grounded in the present day, there’s an old-fashioned quality to Boone’s dialogue and characters; she skillfully blends rich magic and folklore with adventure, sweeping romance, and hidden treasure, all while exploring the island and its accompanying legends. An impressive start to the Heirs of Watson Island series. "Delivers a compelling mystery about feuding families and buried secrets, not to mention a steamy romance."